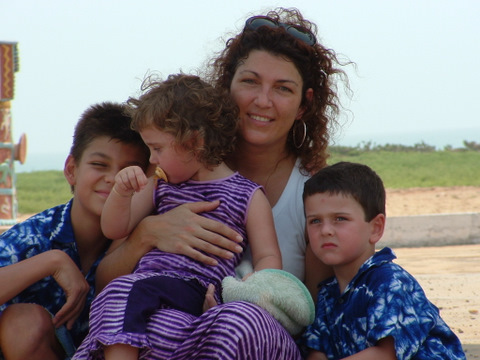 Sharon Biddell in Benin, West Africa, at the gate of no return, with three of her four children: Jake, Sophie and Josh. Myself, my husband Mark and our four children were volunteers working for Mercy Ships, a hospital ship that serves the poorest of the poor in West Africa. As a family we would live in an African community and host volunteer teams from overseas to build orphanages, schools, and medical clinics. Mark was head of the community development department, and I was the women’s programmes manager. I would put together programmes that would enable families to have a sustainable food and income resource so that they would not need to be dependent upon others for their survival and health. We worked with Mercy Ships for nearly seven years before coming to Thailand. We have lived in Phuket for six years now. We originally came to help with building up communities after the tsunami hit Thailand, and then during our stay we visited Patong. We started asking the young women in the bars questions about what their work involved and we were shocked by their answers. Repeatedly we were told how they travelled from the poorer communities of northern Thailand so they could provide for their families. They could not get decent jobs as they were pulled out of school at a young age to help their parents work on the farms and so had very little education. In the end, via one way or another, they eventually ended up selling their bodies to Thai and foreign men. This was a sacrifice they were willing to make for their family’s welfare. TELL US ABOUT THE FOUNDATION. After hearing their stories, my husband and I then decided to offer women alternative employment making jewellery which we would then sell overseas to pay their salaries. We named our foundation SHE, which stands for Self Help and Empowerment and has now grown into giving free bakery lessons, English classes and hotel training. This is all part of our prevention programme. If an uneducated Thai woman travels to Phuket looking for work in the hotels, only to be told she needs a higher education or work experience, then instead of them being turned away and seeking work in bars, we tell hotels to send them to us. The women then receive free accommodation, food and hotel training and when ready, they are sent back to the hotel. Thai people and Thai food. Oil painting, I find it’s the only way to switch off from my busy family and work life. UK-style fish and chips – because I can’t get it here I am yearning for it. I like to listen to Paul Baloche he is a Christian song writer in the States. Don’t expect anything to happen in a hurry, whether it’s setting up your home with things like internet and cable, or for your new environment to feel like home. Language learning. I spent my first week of language learning being sniggered at by staff at coffee shops as (unknown to me) I was asking for coffee with breast milk. I only found out when a Thai lady replied whilst squeezing her breast, “one squirt or two”? Myself as I am perfectly content with the hand that God has dealt me. FAVOURITE PLACE ON THE ISLAND? The SHE centre in Kathu as it has my family there. Date night with my husband at a nice restaurant. WHERE YOU TAKE SOMEONE ON A FIRST DATE? Friendship Beach is a nice place to go on a date. WHAT WOULD YOU CHOOSE TO BE YOUR FINAL MEAL? Fish and chips or chicken tikka masala and a naan.